A profoundly, life affirming film about the trials and tribulations of life, family, love and death, The Red Turtle is a beautiful, wordless fable that cuts to the core. Despite the lack of dialogue, the story strikes upon an immediate emotive poignancy as words are unnecessary when The Red Turtle has the grandiose, expansive visuals it has, and its all consuming score which sweeps us up and into each and every visceral moment the character(s) experience themselves. The silence emphasizes the atmospheric tone of isolation and dependency on nature, as we’re left to watch and engage in what he characters do and how they act, rather than mindlessly listen to their back and forth. The Red Turtle asks its audience to be as attentive to the movie at hand as its characters are to the ocean that surrounds them and the island they’re forced to call home. A man is stranded on an island with little hope of escape despite his able-bodied physicality and intuition. He lives and breathes the island despite multiple attempts to leave, all put to an end by a feisty red turtle. To say more is to say too much about a film best observed with little to know prior information. Yes, he isn’t always alone on the island, but that’s as much as should be said. Directed by Michaël Dudok de Wit the film succeeds in its ability to express itself and its characters emotions on a minimalist scale. We don’t need to hear about the distress they’re feeling or be explicitly told about what signs convey danger. Instead, the audience is treated with respect and intelligence, expecting us to pick up on these clues and character traits along the way. That trust in the viewers goes a long way as it allows for the tension to build organically until the climax, where we too are worn out from the sand, wind and waves of the tropical island. From script to screen The Red Turtle demonstrates impeccable artistry. The visuals bleed onto the screen from the start, with our leads head emerging from a violent sea which spins and spits him out without any sense of humanity or care, simple a nature beast which can dispose of humans at will. The art becomes transcendent when we’re given depictions of endless night skies, of what lies beneath the surface of the ocean and the alienated feeling of being adrift at the heart of bamboo stalks. The animation is remarkable fluid, working as a picture book more than a strict animated film. This isn’t Pixar, and there is no easily digestible film for a child to view, but it is something moving, important and complex in its ability to deal with faith, spirituality and what it means to be human and how we relate to the nature that engulfs us. There is little surprise that Studio Ghibli picked this little film up as it very well fits into the studios motif of humanity vs. nature and what connects us all. The score too adds greatly to the overall visceral reactions the film generates as it is the dominant sound of the film with little to no dialogue. There were moments of breath taking beauty as it sweeps in and elevates the entire pictures quality. It’s all very grand, very big, and it adds a sense of gravitas to the proceedings for a film which could unfairly be judged as thin for its little obvious storytelling substance. Although, those who believe as much simply aren’t paying enough attention. The Red Turtle is one of the more subtle films of the year so far, relying heavily on the omnipresent touch of spirituality and the connective tissue of humans and nature. There is beauty in this film which is largely untapped in film, exploited here to its fullest strength. It’s a masterclass in intricacies and what it means to tell a full and honest story, one that is both celebratory of human nature but also can pinpoint the flaws which lead to our own distress. 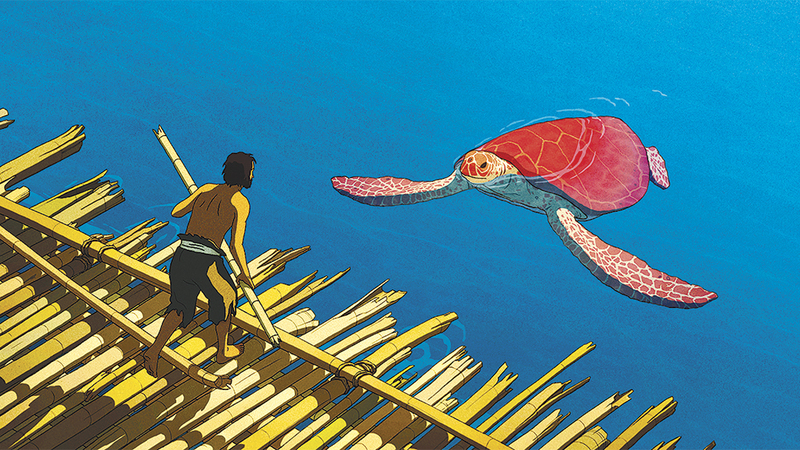 The Red Turtle despite its focus on the creatures of the island is a deeply human film, one that believes strongly in humans perseverance, their spirits and the bonds they form. It’s an extraordinary film and one reminds us that there’s much more to films than the words being spoken.